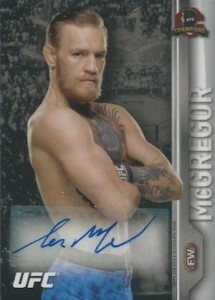 2015 Topps UFC Champions bucks the trend of high-end MMA releases. While hobby boxes have four autographs, they are intended to be significantly cheaper than the other UFC brands from the card maker. The second release under the banner, Champions has a 200-card base set making it among the most comprehensive ever made for the sport. It has a mix of current champs, fighters, retired stars and up-and-comers. Parallels are inserted one per pack with Silver being the most common. Others include Black (#/188), Blue (#/88), Gold (#/25), Red (#/8) and Platinum (1/1). The product has three basic insert sets. Fight Poster Review recreates posters from 25 key UFC events. Fighting's Future highlights 25 of the rising stars in UFC. Championship Clashes looks at the history of UFC through 25 big fights where belts were up for grabs. All three have autographed versions numbered to 25. There are also Championship Clashes Dual Autographs numbered to 10. Fighter Autographs cover more than 40 fighters and UFC personalities. First-time signers, including Paige VanZant, have the standard First Issue stamp. These also have Red (#/8) and Platinum (1/1) parallels. 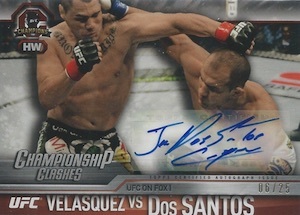 Rounding out 2015 Topps UFC Champions are serial numbered To UFC Champions Scarlet Signatures, which are signed in red ink. 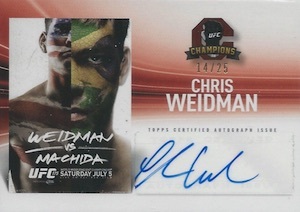 Although 2014 Topps UFC Champions had five total hits per box, memorabilia cards were included in the mix. 2015 Topps UFC Champions doesn't have any memorabilia. 200 cards. Shop for base sets on eBay. 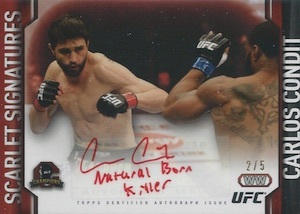 Only one fighter signed each card. A much improved product from last years initial offering. The hit collation of the product has much improved. We opened 1/2 a case and each box had one champ, former champ, scarlet or insert auto and 3 mid/low base autos. It’s nice to see a large array of fighters in this product however there are many noticeables from the active roster that absent from the set. Sam Alvey, Ryan Ortega, Louis Smolka, Mark Hunt & Kid Yamamoto just to name a few. I mean no disrespect to the legends but Chuck, GSP, Royce and Jamie Varner do not need to be in this set. Highlight more of the 400+ active fighters on the roster. Many of the photos are identical to other sets, I know that some of these fighters only had 1 or 2 fights in the last year but I am sure that there are more photos than the 1 used. Not a huge fan of champions but its a decent product to open while we wait for 2016 knockout. Does anyone have a Rampage Jackson base auto? Cannot find one, the only one on ebay is the 1/1 for $800. Does this card exsist? Have 71/73 base auto’s just need the Rampage and Rousey. A nice set of base cards. Includes 4 auto’s which is nice. Of course they are sticker autos. I received a Shogun and BJ Penn auto in one box along with two other so-so autos. Overall a well rounded collection of cards with a nice little collection of hits. For the price this is a good budget set but not much more.